Make no mistake about it; the different diamond cuts and shapes are more important than most people give them credit for. Choosing the right diamond cut and shape is one of the best ways to make sure that you get a diamond with the appearance and brilliance you want at a price you can afford. This is because some cuts provide more brilliance, and some shapes create the illusion of size. In addition, some cuts are more expensive than others. Often the cut of a diamond is mistakenly referred to as the shape (round, pear, oval, etc.) of the stone. Cut and shape are both characteristics that diamonds acquire through human skill. However, they are not one and the same. Much of the confusion may be due to the fact that in literature about diamonds, the word cut usually comes after a particular shape is defined. For example, writers will talk about the brilliant cut, the princess cut, and the emerald cut. Cut. The cut of a diamond refers to the way facets are sculpted into the stone. Diamond cutting is a precise and scientific process designed to allow light to enter and leave the diamond in an optimum way. This process focuses on the angles and proportion of the diamond, as well as its polish and precision of faceting. Professional institutions and associations have set stringent rules about the way a diamond is cut. Shape. A diamond’s shape refers to the form and general contour that the diamond possesses after it has been cut and polished. Diamond cutting technology has advanced so much in the past decade that there is almost no limit to the shapes a diamond can assume. However, the ten most popular shapes are the round diamond, emerald cut, pear-shaped diamond, oval, heart, the marquise, princess, Asscher cut, and radiant. Well-cut diamonds can reflect light like a mirror from one facet to another and disperse and reflect this light through the top of the stone. A well-cut diamond will be symmetrical, and it will possess proper depth and width. These features will result in optimal radiance. On a classic round brilliant-cut diamond, for example, 57 or 58 facets must be precisely aligned so light will enter the diamond and reflect back through the large top facet or table of the diamond. Diamonds that are cut either too deep or too shallow can lose light through the sides and bottom. They will be less brilliant, and ultimately be of less value. The universal cut-grading scale, as defined by the American Gemologist Society Laboratories (AGSL), is outlined below. Currently, only round diamonds are graded according to cut. GoldeNet Australia does not carry any diamonds below the cut grade of ‘Good’. Ideal Cut: Represents roughly the top 3% of diamond quality based on cut. Diamonds with the ideal cut are perfectly proportioned with the highest grade of polish and symmetry. This grade of diamond reflects virtually all light that enters it. 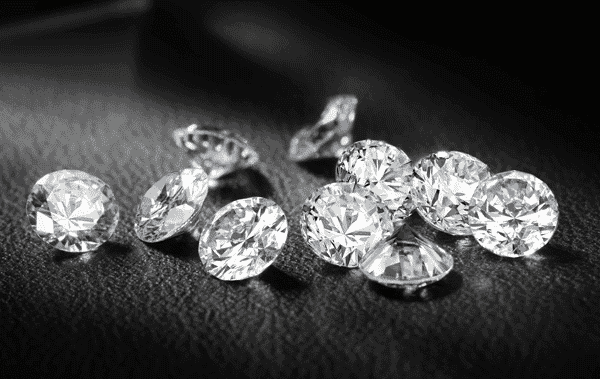 They are the most brilliant, rare, and expensive diamonds. Excellent Cut: Represents roughly the top 8% of diamond quality based on cut. Diamonds cut with this grade are proportioned to fit strict requirements for table and depth percentage. They reflect almost all light but less than the ideal cut. They are still quite rare and very expensive. Very Good Cut: Represents roughly the top 15% of diamond quality based on cut. These diamonds are proportioned to reflect much of the light that enters.These are high quality and moderately priced diamonds. Good Cut: Represents roughly the top 25% of diamond quality based on cut. They are proportioned to reflect most light that enters. These are quality diamonds of considerable value. Fair Cut: Represents roughly the top 35% of diamond quality based on cut. It is disproportioned but allows some light to be reflected. Poor Cut: This includes all diamonds that do not meet the proportion standards of a fair cut. When a diamond is disproportioned most of the light entering it is lost out of its sides and bottom. Important characteristics of a round diamond cut are described below. Some diamond cutters will compromise on the cut of the diamond in an attempt to optimise the diamond’s weight (carat). This can result to a larger diamond with a duller appearance. If all Cs are equal (cut, carat, colour, and clarity), there can be as much as a 50% variation in the cost of a diamond if the cut is of poor quality. Here are some specific ways that the cut of a diamond affects its brilliance, appearance, and value. 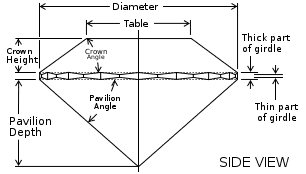 Table Size %: This refers to the table length relative to the diameter of the diamond. A table that is too large or too small will reduce the overall dispersion of a diamond’s brilliance. Crown Angle: This refers to the angle between bezel facets and girdle. Crown percentage is a measurement that measures the depth of the crown in relation to the diamond’s overall depth. 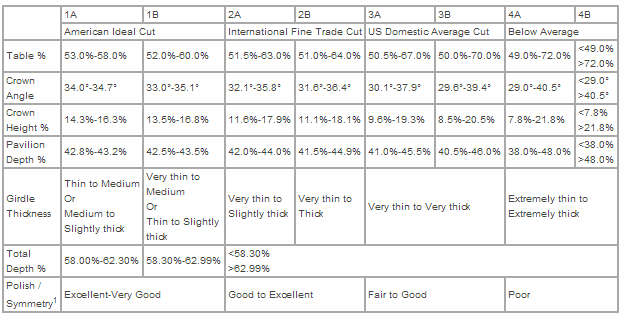 Girdle Thickness: Ranges from extremely thin to extremely thick (assessed visually). Extremely thin or extremely thick girdles are less desirable than more moderate girdles. Depth %: Measurement of the distance from the table to the culet (bottom-most point). A depth that is too shallow or too deep will allow light to escape through the bottom of the stone, reducing the stones overall fire and brilliance. Culet Size: Ranges from pointed to extremely large (assessed visually). Unless the culet is abnormally large, it generally has no impact on the value of a diamond. Symmetry: Refers to the overall uniformity of the cut of a diamond and is graded poor to excellent. Symmetry is based on the diamond’s proportions, the relation of one facet to another. A diamond with good symmetry can be more attractive than a less symmetrical stone. Stones with poor symmetry can actually appear off-centered. Polish: The overall quality and uniformity of the polish of a diamond. It is graded poor to excellent based on the final finish applied to the facets and facet junctures by the cutter. Well-polished diamonds permit maximum passage of light and prevent potentially streaky surfaces. Which Cut Grade Should I Choose? If you want a diamond with the best cut or one that will look exceptional even when viewed under a microscope, you will need a diamond that reflects the most brilliance. These diamonds are cut to the most accurate proportions, and they will have the highest polish and symmetry grades for round diamonds. If you are out to buy a diamond, get the piece that will rate well in terms of the four C’s but do not underestimate the importance of the diamond’s cut because this is what allows it to truly shine. Some diamond cuts have remained popular through the years. This is partly because of their appearance, and partly because of the ease with which they can be placed in settings. Here are some of the most enduringly popular diamond shapes. Round. Through the centuries, this shape has retained its popularity. This is possibly because this shape offers more design flexibility than others, and it is better at hiding a stone’s flaws. The round brilliant shape has been around since the 18th century, but the style in producing this shape has been revised through the years. In some cultures, the round diamond is considered a lightning rod for good luck because it is shaped like a coin, which symbolizes money. Picking a classic brilliant cut diamond means stability and a preference for the tried and tested. Oval. This shape has probably been around the longest, and there are accounts of famous and historical diamonds in this shape. 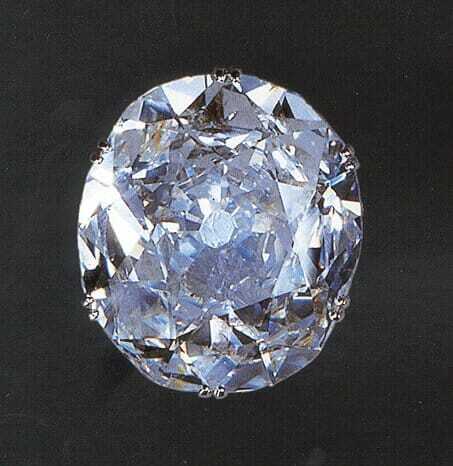 One such gem is the Kohinoor, which is now kept in the Tower of London. Ovals can be narrow or wide so you can choose whichever variation you like best. The disadvantage of this cut is that unless an oval center stone is set on high prongs, a flat wedding ring next to it won’t fit snugly. An oval diamond means creativity, and it indicates an innovative disposition. Marquise. This shape first came out in 1745 in honor of Marquise de Pompadour, who was the mistress of the king of France. The marquise cut has several advantages over other shapes. Just like ovals, marquise cut diamonds can be narrow or wide. Whichever shape you choose will have the added bonus of owning a stone that looks larger than it really is. This cut points out that the wearer has a penchant for the dramatic and the luxurious. Emerald. The emerald cut diamond is using a style originally meant to showcase the emerald. A really good diamond will look fabulous in this particular shape because it will display just how clean the stone really is. On the other hand, diamonds with a lot of inclusions do not do very well with this cut. Diamonds in this shape can be quite expensive per carat. Heart. This shape is considered by many to symbolize romantic love. Like the emerald shaped diamond and the marquise, the heart shape requires a highly skilled craftsman to ensure the stone’s balance. This shape means that the wearer is passionate, romantic, and sensitive. 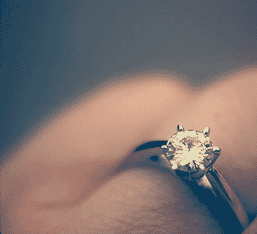 Some relatively new diamond shapes have gained popularity among engaged couples. These include the princess cut, Asscher cut, quadrillion, radiant, barion, and baguette. For some, these shapes are more impressive and adventurous than the traditional round diamond. Which Shape Is the Right Shape? Deciding on the best shape will always be a personal and highly individual choice. As a whole, though, it is good to remember a few facts about the different diamond shapes. Combined with a working knowledge of diamond cuts, a clear understanding of diamond shapes will help a buyer choose the stone that he or she can treasure for years to come. As a whole, round diamonds are the most expensive per carat, partly becausethey are highly in demand. Asscher-shaped diamonds, cushions and emerald cut diamonds are generally cheaper than rounds, but they look smaller than round diamonds of the same weight. If you want to have some splash on your finger, you may end up having to spend more with these shapes. Ovals, marquise, and pear-shaped diamonds can cost anywhere from 20-25% less than their round counterparts. Diamonds without corners are generally easier to set, care for, and maintain. It is always best to buy your engagement ring from an institution with a solid reputation. Choosing a diamond is one task where practicality and romance must come to a happy compromise. Especially when diamonds are chosen for engagement rings, it is important for a couple to get the one that speaks of them as a couple without jeopardizing their finances. The right cut and the right shape will mean a ring that can be worn daily with pride and joy.